a berserker stuck in traffic by Erik Richardson. Pebblebrook Press, 2014. Where to start talking about Erik Richardson’s a berserker stuck in traffic…. 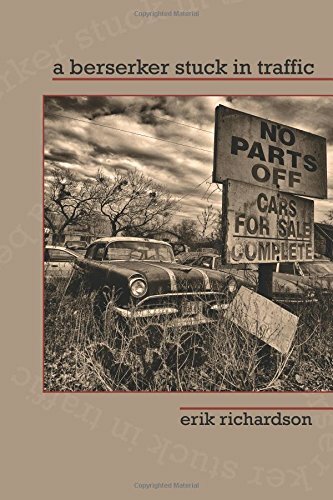 I could start with the eye-catching visual image of this slim book of poetry, the sepia cover photo of vintage cars in a neglected lot, clouds gathering behind hand-lettered signs announcing cars for sale. This is a book you will want to pick up, open, and discover the content inside. I could talk about the formatting of the poems: attractive font, professional layout, added features of the title and poet’s name running in the margins on alternate pages. I could tell you about my favorite poems: poems about love and work, teaching and parenting, the past and its connection to the present. Just about every poem in this collection, I would name as a favorite. In the end, however, poetry is about word choice, vibrant imagery, and fluid syntax. Richardson is a master of these poetic expressions; so let me tell you about the imagery in Richardson’s poems. Let’s look first at “absolute values,” which also happens to be my favorite poem in this collection. binding us in place in mexico, missouri. as hard as January ice, you cried. and I start over at zero. When you think all that can be said about love has already been said, read “absolute values” and discover a new perspective. It’s the originality of these images that make them memorable, the surprise in the word choice that we won’t forget. So, as the cover invites, open the door to this lovely book. You’ll enjoy the ride. Kathleen Serley, Wausau, teaches English and enjoys writing poetry. Her poems have been published in The Solitary Plover, Volga River Review, Verse Wisconsin, The Ariel Anthology, and Verse and Vision where she won the Artists’ Choice Award in 2012. We’re glad you enjoyed the book as much as we did, Kathleen. Thanks for the awesome review! Readers who are interested in buying the book can do so through our website: http://www.stoneboatwi.com/pebblebrook-press.html.